Born Oscar Fingal O'Flahertie Willis Wilde in Dublin in 1854. Oscar Wilde was the son of somewhat unconventional parents - his father, Sir William Wilde, though a surgeon by occupation, was also a talented writer, and his mother, Jane Francesca Elgee, was a well-known poet and journalist who published under the pen name 'Speranza'. During his schooldays, Wilde excelled at classics, and he went on to win scholarships first to Trinity College, Dublin, and then to Magdalen College, Oxford, where he was awarded the Newdigate Prize for his poem, Ravenna. Whilst at Oxford, Wilde gained notoriety for his unorthodox dress and opinions, hailing himself a disciple of John Ruskin and Walter Pater. Upon graduating in 1878, Wilde moved to London and became spokesperson for Aestheticism, the movement that advocated art for art's sake. 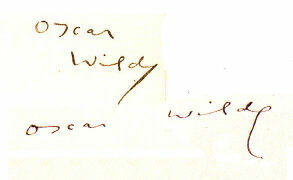 In 1884 Wilde married Constance Lloyd, and they had two sons in quick succession - Cyril in 1885, and Vyvyan in 1886. In order to support his family, Wilde took a position with the magazine, The Woman's World, but this proved short-lived, and he left the publication in 1889 to concentrate on his writing. His only novel, The Picture of Dorian Gray, which had caused a public outcry when it appeared as a play in 1890, was published in 1891, with Lord Arthur Savile's Crime, and Other Stories, following soon after. A number of plays then appeared including A Woman of No Importance (1893), An Ideal Husband (1895) and The Importance of Being Earnest (1895), and it is for these theatrical masterpieces that Wilde is now best remembered. In 1891, Wilde met Lord Alfred 'Bosie' Douglas, the third son of the Marquis of Queensbury, and the two soon became lovers. The Marquis of Queensbury strongly disapproved of their relationship, and publicly accused Wilde of homosexuality, leading to his imprisonment in 1895. His time in gaol inspired two works, The Ballad of Reading Gaol (1898), and De Profundis which was not published until after his death. Wilde spent the final two years of his life traveling in Europe, staying with various friends and publishing articles in newspapers. He contracted meningitis in 1900, and died in a Parisian hotel on 30 November. ◊The Happy Prince and Other Tales (1888) [Collection] – includes The Happy Prince, The Nightingale and the Rose, The Selfish Giant, The Devoted Friend, The Remarkable Rocket. ◊Lord Arthur Savile's Crime and Other Stories (1891) - includes Lord Arthur Saville’s Crime, The Canterville Ghost, The Sphinx Without a Secret, The Model Millionaire. ◊A House of Pomegranates (1891) [Collection] – includes The Young King, The Birthday of Infanta, The Fisherman and his Soul, and The Star-Child.